Typically ships from warehouse within 24 hours of order. 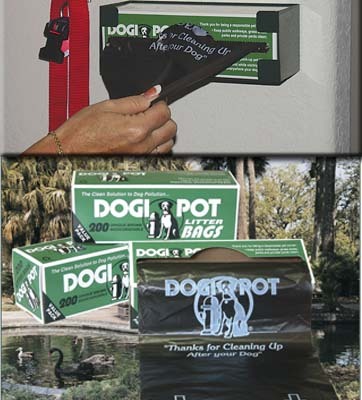 Dogipot® dog waste bags #1402-20. Case of 20 rolls. No campground or RV park should be without our pet waste bags. Dogipot® pet waste dispensers help remind dog owners to clean up after their pets. With dog poop bags readily available, dog owners will have the means to clean up after their pets when incidents occur. A great investment if you don't have to clean up the pet waste yourself! Campgrounds and RV parks simply charge an extra fee for campers with dogs to cover the cost of the pet waste receptacles and pet waste bags. Pet waste bags are dispensed out of an eye-appealing, practical dispenser box with 200 bags per roll which also fit in both the Dogipot® Jr dispenser and Dogipot® pet waste receptacles or pet waste stations. Dogipot products are the smart solution to dog pollution. Go to top of this Dogipot Pet Waste Litter Bags 1402-20, Qty 4000 page.